Yea, Claire and her gal :) I promised Fernie I will bake some cookies for her and these came just nice since I could not make them in time for Jo . And you can guess as much that it was Claire who almost finished half the tupper before the tupper reached home. * head shaking ** and I have to remind her , " please don't finish all , keep for Fernie " :p and the tupper at home..you can also guess who gobbled all...the Wild Boar of course !!! Below are pictures showing the steps taken to make these sablés ..... it is not that hard to make...just remember to place the pistachio coated rolled dough in the refrigerator preferably overnight to allow it to be more firm so that it is easy to cut them into 5 -6 mm thick slices . A beautiful and flavorful french cookie. Cut the softened butter into pieces and beat it with a wooden spoon in a large bowl until creamy. Add in the sugar and beat until it’s well incorporated with the softened butter. Add in the egg yolks and the lemon juice and beat until it’s mixed well with the other ingredients. Add the sifted flour and the almond ( hazelnut ) powder, and mix until incorporated with the wet ingredients but avoid overworking the dough (it would make the cookies harder during the baking process). 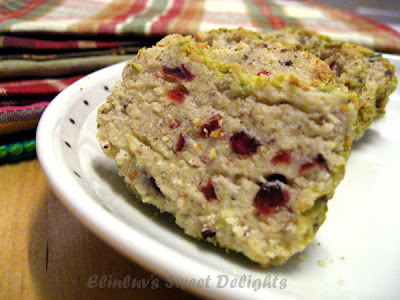 Add in the dried cranberries by hand and mix them to share out equally. Divide the dough in two pieces and form a roll. 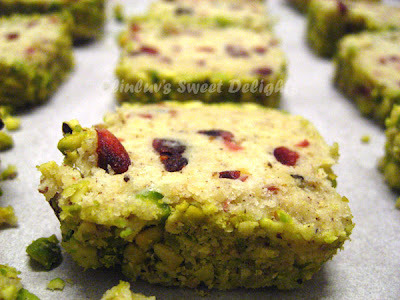 Put the minced almonds/pistachios onto an aluminium paper and roll the cookie dough, elongating it to a length of 20-22cm. Repeat likewise with the second roll. Wrap the dough rolls into aluminium paper, making sure the ends are closed tight. Put the rolls into the fridge, leaving it there for several hours, preferably over night. You’ll see that the dough will be really firm and ready to be cut the next day. Preheat your oven to 180°C. Put parchement paper onto two baking trays. Unpack one roll from the aluminium paper and keep the second one still in the fridge , cut it into 5-6mm thick slices. Put the slices onto the parchment paper, making sure there is enough space between the cookies (they spread a little). Bake the sablés for about 12 minutes depending on their size and the temperature of your oven, until the edges are lightly toasted. Leave them on the tray for a couple minutes before transferring them onto wire racks to cool completely. 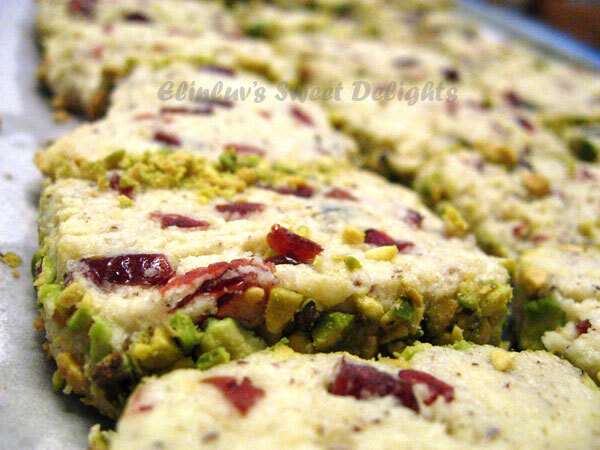 A god-sent recipe as I have about 2kg of pistachio in my pantry.Do you toast the pistachio before using?Thanks. 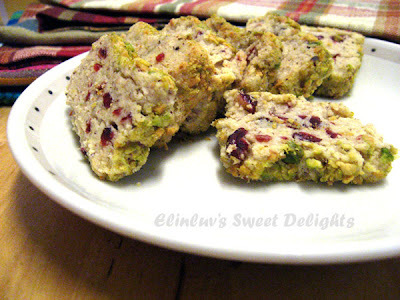 SO pretty with the contrasting red of the cranberries and green of the pistachios!! I've never had sables before! Thanks for sharing these beautiful French cookies with us!!! Lynne....oh when you are well again , do try this :) It is awesome ! oh elin, i wish i cld just have a piece of this now. I can see that the dough all covered up with pistachios, that must be so crunchy and tasty..sounds like really one of the best sables in the world! Elin, the sables looks terrific! Oh... loving the outer layer so much. Simply gorgeous. Thanks for sharing. Hope you're enjoying your weekend. My husband would eat anything with pistachios!! I've not had a sable before, but you have me so tempted. Nicely done! Claire...no need..you are my free taster...LOL!